What Can You Clean With Simpson MSV3024? The Simpson Cleaning company has been making cleaning machines for over 50 years and they are very popular with commercial customers. Since their start, they have dedicated themselves toward making heavy-duty cleaning machines that pack a lot of power. Their efforts were noticed by the larger international FNA Group which bought them in 2006 and helped them expand in the USA. We will provide you with an unbiased Simpson MSV3024 review since it is a good model with enough power to serve as a residential or entry-level commercial cleaning machine. We will test the unit and report our views on the pros, cons, and other useful product information. The Simpson MSV3024 is a gas-powered pressure washer designed to handle a variety of cleaning jobs. It runs on a 190cc Honda GCV190 OHC Engine with a 1 quarter fuel capacity. The machine pumps out 3000 PSI at 2.4 GPM. This gives the MSV3024 a cleaning power of 7200. That is enough to attack most types of stains on just about any surface. 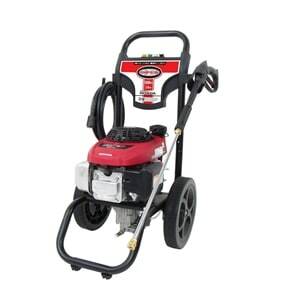 The MSV3024 model is designed to blast away dirt and grime. It runs on gas, so that means no power cord to drag along! It weighs around 62.5 pounds, which sounds like a lot but it is mounted on a heavy-duty frame with 12″ never-flat tires. That gives you good mobility on just about any terrain and the weight makes sure it won’t just roll away from you or be blasted because of the pressure output. The unit also comes with a 30-foot high-pressure hose, providing you a lot of lengths to walk around and work. The frame comes with a tray that can store 4 color-coated nozzles which are easy to attach. They all serve a different cleaning purpose for a variety of stains and surfaces. The nozzles included are 0°, 15°, 40°, and a soap nozzle. With them, you can cover a range of applications, from light washing of your car and windows to get the grease of off your grill. The wand has a safety measure built-in – it has a trigger lock to prevent injury since 3000 PSI can cause real damage if blasted in close vicinity. The Simpson MSV3024 also comes with a maintenance-free Axial cam pump which provides easy starts and reliable performance throughout its usage. This means that you don’t have to worry about putting oil into your pump to keep it working, but you still have to winterize it if you want to be able to use your machine the next season. Make sure to never let the engine and pump run for over 2 minutes while not spraying water, as this builds up a pressure in the unit and can cause overheating and damage to the unit. Simpson Cleaning has worked on creating a customer service that helps with issues their machines sometimes face, but they tend to change their authorized service centers often. If something goes wrong with your pressure washer, you must contact the company, not the retailer and they will tell you where to take your unit for closer inspection. The attachments and accessories are only covered with a 90-days limited warranty. The frame and pump have a 1-year limited warranty, while the engine is covered by Honda’s warranty separately. If the unit is used for private residential purposes, the motor gets a 2-year limited warranty, but if it’s used commercially, Honda gives a 1-year limited warranty on its motor. Since the machine is assembled by Simpson Cleaning, whatever the issue might be, you first need to contact the company, so that they can find out what’s wrong with the pressure washer. The Simpson MSV3024 is a powerful machine built to get rid of heavy stains. We used it according to its user manual on cars, windows, wooden fences and decks, unpainted bricks, a grill, and driveways. If you use the proper nozzle for the job, the Simpson MSV3024 can handle any light and most medium cleaning jobs. It can handle working longer than most residential cleaning machines but you need to be careful and make sure that your pump or engine don’t overheat. It is a durable, reliable gas-powered pressure washer that is very versatile and can cope with most medium residential needs, but this unit also has the potential for commercial use. Its design makes it a compact model that’s easier to store than other gas-powered pressure washers that weigh more than 100 pounds. Because of their policies, you may have to be patient with their process of dealing with units that have a malfunction or have broken down completely. Simpson Cleaning uses proprietary parts so as long as you have the warranty, all parts must be replaced by their service centers. Besides, other parts might not work in the same pressure washer and install them voids the warranty. This unit is prone to overheating and breakdown if left running and not spraying water. If you are looking for something that has more power than your garden variety pressure washer, the Simpson MSV3024 is a good pressure washer that can tackle dirt, grime, grease, oil and more. Simpson makes durable units, and they rarely break down. If you use it as shown in the manual, you won’t have any issues. The never-flat tires and solid frame offer great mobility and the attachments give you a lot of versatility. The owner’s manual is easy to understand and the unit itself is simple to operate. If you are looking to start your own commercial business this model is a good entry-level model, but we would recommend something with a bit more power to handle your cleaning business needs. We hope we have covered all of the important points in our Simpson 3000 psi review. If we haven’t please feel free to write down your questions in our comments section and we will readily reply.